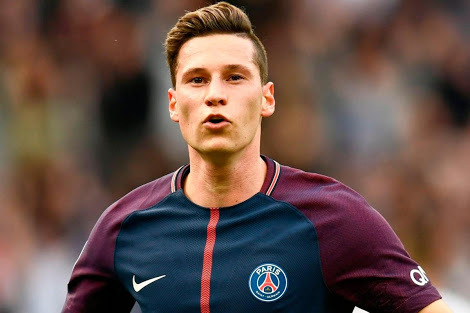 Liverpool manager Jurgen Klopp is reportedly planning a surprise summer move for Paris Saint Germain forward, Julian Draxler, as a replacement for Philippe Coutinho. The 25-year-old forward joined Spanish League side, Barcelona during the winter transfer window in a five-year deal worth £142 million, and the German born tactician is on the lookout to fill the void the Brazilian left. Despite the departure of the former Inter Milan man, Klopp has been able to manage the Anfield outfit well, qualifying them for the Champions League quarterfinals as well as working hard to wrap up their season on a high. The five-time UCL winners are currently second on the log of the English Premier League table with 63 points from 31 league matches – they have played one game more than the two Manchester clubs, who are topping the table. Meanwhile, the former Borussia Dortmund handler has enough money on him to go after any player of his choice, based on the fact that Coutinho’s money is still lying in the bank. During the January transfer window, Netherlands defender, Virgil van Dijk, joined Liverpool in a deal worth £75 million from Southampton. They are also expecting to seal Naby Keita’s deal from RB Leipzig at the end of the ongoing season. Meanwhile, Klopp is hoping to make his team more formidable by signing the 2014 FIFA World Cup trophy four years ago. According to report, Draxler has been regarded as one of the best young attacking players in Europe, whose style of play has been compared to that of Coutinho’s. But his lack of playing time, including just four goals has characterized his season, and Germany international might likely hand the club a transfer request at the end of the year, with Liverpool first in line to land the ex-Wolfsburg winger.